This project is for an existing medical products customer, with whom we've enjoyed a nearly 30-year relationship. They had experienced rapid growth of this product line and came to us for help in finding a way to increase capacity and also hopefully lower costs—a natural fit for a higher cavity mold. 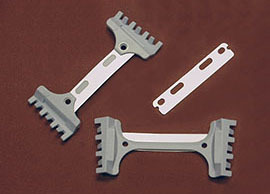 Klann engineers designed a new mold using SolidWorks which doubled the number of cavities to 8. We sourced the building of the mold through one of our trusted Asian mold-making partners at a very reasonable cost, resulting in a positive return on investment for our customer after only 6 months. 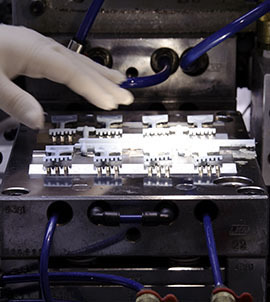 The surgical blade assembly is molded and packaged in our dedicated Class 10,000 clean room. The resin is a 10% glass filled natural polypropylene which is molded around a surgical stainless steel blade insert. A blue colorant is blended with the base resin at the machine. We perform SPC on the finished parts, including a pull test on the Poly-Poly pouch.